Barry takes on a dangerous meta who can control technology and confronts and obstacle in his personal life: the ramifications of abandoning Iris for six months to balance the Speed Force. Meanwhile, Gypsy prepares for a hot date with Cisco, but she gets annoyed when his work keeps them apart. *Den of Geek - "Mixed Signals" gets by on charm, but not much else, and we expect better from The Flash. 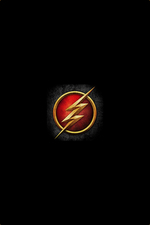 *IGN - The Flash goes to therapy. This felt like a step in the right direction for a change. Iris called out how him making decisions for her wasn't actually charming. She got him into therapy. She got him to admit any kind of wrongdoing. It seems like there's hope his behavior might improve, which would go a long way toward me actually liking him again. Ditto Cisco listening to Caitlin and attempting to be a better boyfriend. I do feel like the meta of the week was pretty lackluster though. I mean, it's telling that they had to add a bunch of pointless, implausible tech to Barry's suit to make him a credible threat. Did they change the actor who plays Wally? He showed up and I was all who's this speedster? Did they introduce this character and I missed it, but then it seemed like he was Wally, so I was very confused. Is it different hair or a different actor or...? Same guy. I think the mask might be throwing you - Barry's looks good, but Wally's changes the shape of his face or something. I'm really not a fan of the design. Wally is the same actor, but he has a totally new hairstyle that somehow makes him look way younger. Can someone remind me why Draco Malfoy's magic necklace doesn't work on Caitlin anymore to keep Killer Frost at bay? I know there's some reason, but I've blocked a lot of last season out of my memory. I like the new hairstyle of Wally. Reminds me of a young Wesley Snipes. So Barry and Cisco are Silicon Valley fans. That was a nice little discussion for a show that nobody watches (unlike the Game of Thrones bit). Wally's new hairstyle was a dramatic change (for the good, i think), his new mask on the other hand, was dramatic in the completely opposite direction. I'll join the chorus of those saying it's about time Iris gave Barry a firm talking to--he has deserved one for years. Sadly, I have no reason to believe it will stick. Good points on how one shouldn't bail on their girlfriends. Especially on Valentine's Day...er, 111 Day. Loved Cisco's shirt, and then was sad because I googled for it and it turns out to be a Big Bang Theory thing. It's funny, I don't recall that shirt from BBT. Usually the shirts on that show are logos for DC characters. Omg how did I not realize this until now?? Like goddamn mind blowing right now! I guess I didn't care enough about the character to look up the actor (I mean, can you blame me with that ham fisted Savatar's puppet plot and then shoe horned romance with Cait? ), but holy crap! Cisco has worn BBT-themed shirts for most of the run of the show, to balance Sheldon's wearing of Flash-themed shirts on BBT. he used to wear non-BBT stuff in season 1 and 2. I was excited when he wore a shirt that I actually have. and a bona-fide nerd like Cisco would hate BBT. Well I guess everything is back to normal and we won't have any trouble with theSpeedforce ever again! It is ridiculous on my part that on a superhero show with speedsters, portals, and time wraiths that I have problems with the believability of someone with powers that can infect technology/computer code. "This new meta villain can create pockets of slow time"
"This new meta villain can interface with computer code organically!" Me: I have several questions. The counseling scenes were well-written and went from darkly humorous/absurd to cutting in an instant thanks to Candice Patton. The haircut caught me off guard too. The guy (warden?) at Iron Heights is in on whatever the Thinker's plan is. I loved the goofiness of the malfunctioning suit but thought it was tone deaf to have that happen when someone is literally being tortured. Is Wally going to be the designated "character with nothing to do" this season now that Iris and Caitlin are much more proactive? I mentioned this in last week's Arrow thread but in their season premieres Flash, Supergirl and Legends jumped ahead six months from their finales while Arrow only jumped five months. The newspaper with Oliver on the cover means that Flash and Arrow are in sync, but when last season did they get out of sync? I think they always were a bit out of sync, weren't they? Didn't the crossovers (or one of the crossovers) happen one week apart?